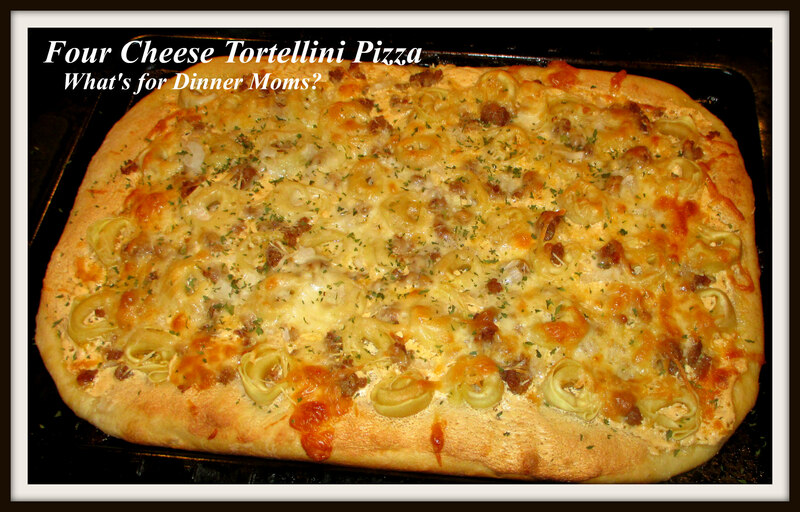 4 Cheese Tortellini Pizza – What's for Dinner Moms? I was thinking about creating a Thanksgiving Pizza for dinner but my ever fiscally responsible son reminded me we would need to buy turkey, ingredients for stuffing, mashed potatoes and cranberry sauce. He was right. We should use what we have on hand first. So, we went searching through the freezers to see what we could find. We had tortellini, leftover cheese sauce and all kinds of cheese. There was a restaurant back in Rochester, NY, that has since closed, that made pizzas with all kinds of unique toppings. They had a Macaroni and Cheese Pizza, a Ravioli Pizza, a Jalapeno Popper Pizza, etc…. We decided to follow their lead and create a 4 Cheese Tortellini Pizza. Yes, pizza with tortellini baked right on top! There were thumbs up all around the table for this dish. The garlic and cheese sauce added a great flavor to the pizza and the tortellini were perfectly cooked. I made 2 pizzas but one would have been plenty. The tortellini made the pizza extra filling. We had enough leftovers for 3 large lunch servings. Serve this dish with a spinach side salad and it is a complete meal. Remove Italian Sausage from casing if in links. Break into small pieces and cook over medium heat until browned and cooked through. Place sausage on clean paper towels and blot to remove excess grease. Set meat aside. Melt butter in a medium saucepan over medium heat. Once butter is melted whisk in flour until smooth. Cook 1-2 minutes until slightly golden. Add half and half and continue whisking until no lumps remain. Allow to cook 5-8 minutes until sauce reduces and becomes thick. Remove pan from heat and add 2 cups of sharp cheddar cheese. Stir until no lumps remain. Allow sauce to cool slightly. Prepare crusts for toppings. Stretch dough into a greased pan. Coat both crusts with a generous amount of cheese sauce. Sprinkle powdered garlic over the entire pizza. Add as much or as little as your family will like. Mine like a generous sprinkle for added flavor. You can also use fresh garlic if your family likes that too. Place 1/2 of the tortellini over the top of the cheese sauce on each pizza. Sprinkle 1/2 the mozzarella cheese and 1/2 the Parmesan cheese over each pizza.